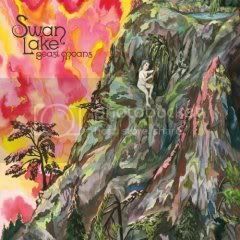 Canadian Indie Rock Supergroup Swan Lake returns for a sophomore effort in 2009! All indications are that Enemy Mine, the followup to the band's majestic and weird Beast Moans (2006), will be in the hands of fans on March 24th. Neither the band or it's label, Jagjaguwar, will be offering tracks from Enemy Mine to the media until late February - presumably in an effort to keep a lid on the thing and to prevent leaks. One thing's clear, the visionary minds behind Swan Lake haven't thrown in the creative towel. Despite all their regular jobs, Spencer Krug (Wolf Parade, Sunset Rubdown), Carey Mercer (Frog Eyes, Blackout Beach) and Dan Bejar (Destroyer, New Pornographers, and Hello Blue Roses) found a divergent track on 2006's Beast Moans. It's completely reasonable to think they will hit gold on the forthcoming Enemy Mine, as well. It is the band's contention that this is the first known use of a "court painting" as a record cover used in popular music. As a result of this enthusiasm, the band had planned on calling the album "Before the Law", a beloved Kafka parable and a reference to this court painting. 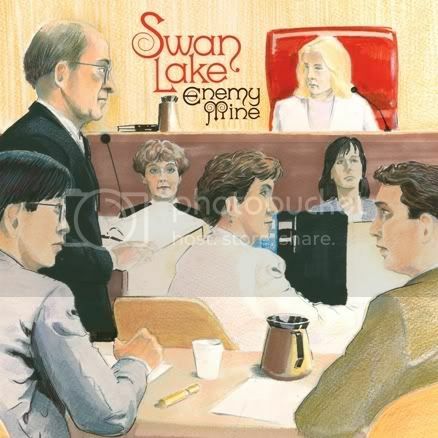 However, the band is tired of being tagged as "literary", so they dubbed the record Enemy Mine, a beloved movie from Bejar's youth, and a good metaphor for collaboration. For the uninitiated, here are two songs from 2006's Beast Moans. Good stuff!